Why would I need self storage in Overland Park, KS? There are a variety of reasons why you might need self-storage in Overland Park, KS. How much is a storage unit in Overland Park, KS? The cheapest storage unit in Overland Park, KS is $38.00 per month. What size storage units do you have available in Overland Park, KS? In Overland Park, KS we have sizes that range from 5'x5' to 20'x30' to suit your storage needs. How much is it for a 5'x5' storage unit in Overland Park, KS? The cheapest 5'x5' storage unit in Overland Park, KS is $38.00 per month. Overland Park is one of the largest cities in Kansas, and it has grown at an impressive rate since its incorporation in 1960. It's considered part of the Kansas City metropolitan area and shares borders with the city and several other large Kansas towns. A mainly suburban area, Overland Park has been named by numerous associations and companies as one of the top places to live in the nation. The area's low poverty rate, sunny weather, affordability and friendly sense of community all contribute to its popularity. Just 20 minutes south of Kansas City, Kansas, this town offers a quiet life in a tight-knit community while still providing the convenience and attractions of a nearby big city. You can head into Kansas City to enjoy world-class dining; cultural activities like theater, arts and museums; and professional sports. In addition to local professional baseball and football teams, the Kansas Jayhawks college men's basketball team is a local favorite. With over 1,500 acres of public parks and green space, there's plenty of opportunity to explore the outdoors. You can enjoy hiking and biking trails, tennis, basketball, golf and children's playgrounds at any one of more than 70 different parks in the city. If you're interested in checking out the local scenery, you can take a walk through the Overland Park Arboretum and Botanical Gardens. The site has been designed to allow enjoyment of the natural wildlife of Kansas and features prairie grasses, a riparian woodland and a variety of native trees. The largest economic sector is the service industry, with health care, retail, education and finance also playing important roles. Sprint Corporation is one of the most well-known companies headquartered in the city and provides thousands of jobs for the local economy. Other large employers include the city's major public school districts, Black & Veatch Engineering Consultants and OptumRx. 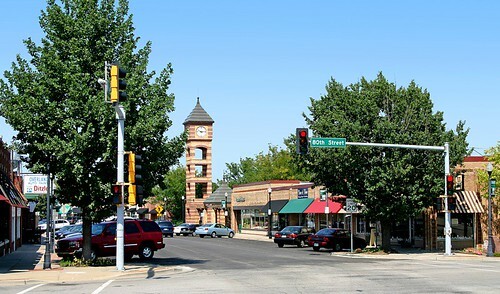 Downtown Overland Park is the trendy, urban center of this otherwise quiet suburb. Here, you can find modern lofts, hip apartments and a growing business district. Mission Hills is a suburb of Overland Park, a small but affluent community that's a popular choice for families. In 1928, the neighborhood was a temporary home to Ernest Hemingway, and he penned "A Farewell to Arms" while staying here. Winning the 1949 title of the best planned community in America, Prairie Village was developed with the goal of providing housing for returning war veterans. Today, this suburb of Overland Park is a flourishing family town hosting community events promoting the arts, environmental awareness and education. Lionsgate is a small but upscale area. It features one of the city's largest private golf courses, designed by legendary pro golfer Jack Nicklaus. A few different public school districts serve Overland Park, and many of its schools receive excellent ratings for academic achievement. You can also enroll your child in one of the many private schools, which include faith-based, accelerated study and Montessori programs. If you're considering enrolling in a college degree program, there are a handful of post-secondary institutions in Overland Park. You can choose between local community colleges or small university campuses as well as a few specialty schools. Utilities: Your main electricity provider is Kansas City Power and Light. WaterOne manages public water, while natural gas is facilitated by Kansas Gas Service. Garbage and Recycling: Several different companies provide curbside collection of trash and recyclables. Transportation: There are several public bus routes in the city, and they also provide convenient access to Greater Kansas City. The housing market in Overland Park is very strong, with home prices on the rise. Currently, the median price for a home in Overland Park is fairly even with the national average. There are many homes for sale in this area, so you'll be able to choose from a range of options. Expect to find large ranch homes, multi-level modern family homes, condos, apartments and townhouses throughout the city. Our lowest priced units in Overland Park, KS average $53.10 per month. 574 people have reserved units in Overland Park, KS in the past 30 days. There are 10 locations within Overland Park, KS's city limits. There are 5 locations in Overland Park, KS that offer AC and Heating features.